Weather is supposed to be boring. It’s the awkward thing you talk about when you can’t think of what else to say to somebody. It’s the thing you can never EVER start a story with. It’s the thing so unimportant that it goes at the end of the news. Yes, even AFTER sport. But I’ve always been completely charmed by the weather. My enjoyment of some of my favourite activities is dependent on weather. What is better than reading? Reading on a rainy day! You know it’s true. What is better than having a glass of wine? Having a glass of wine in your garden at dusk after a hot day. And don’t even ask me what I like to do best during a storm (this is a g-rated site, after all!) The seasons are changing here in Brisbane. We’re moving in to spring, and today is a beautiful, blue-skied day, sunny and windy at the same time. My hayfever is going wild, there are petals and seeds all over my garden. But look at this picture I snapped with my phone while sitting on the front step watching my children play. 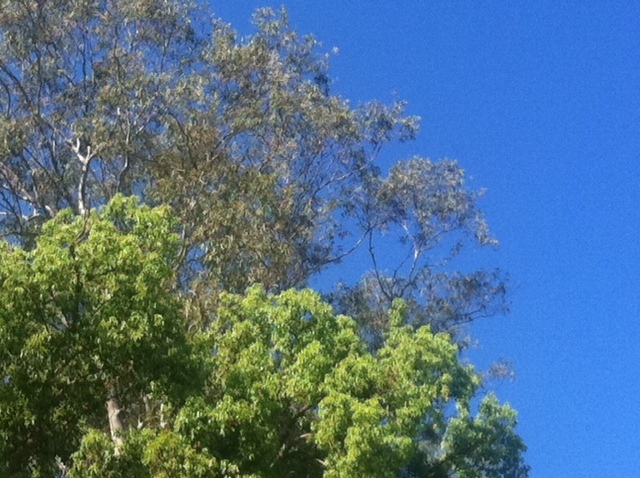 The contrast of the grey-green eucalypt leaves against the brilliant blue sky is stunning. I really love where I live (except for those two months in summer where it’s so hot that leaving airconned spaces should be forbidden), but spring here is particularly lovely as the sunlight and prevailing winds shift, and the world is born anew.